Good morning, lovelies! I am currently en route to the beach. Although it is supposed to be rainy and a bit chilly, I will try and make the best of it. 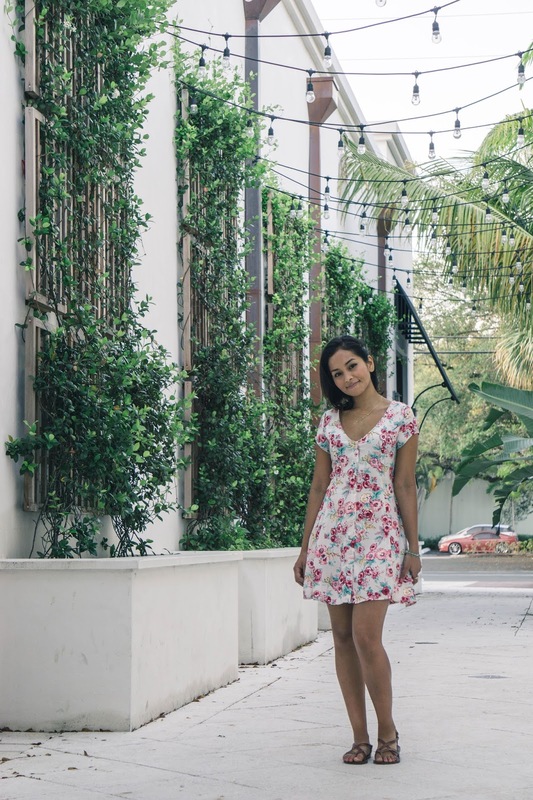 It makes me so envious of my newest blogger friend, Estrella from La Casabloga where I bet she is basking in the glorious Miami sun. 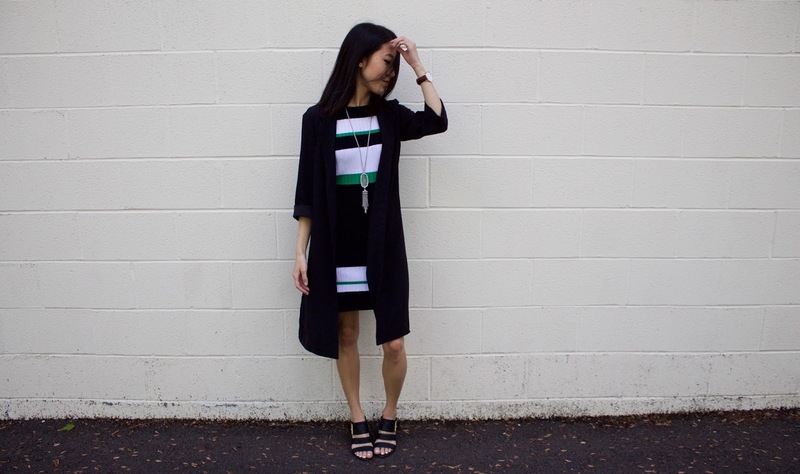 My look revolves around this amazing sweater dress I found in clearance at Forever 21. It immediately caught my eye because of the collegiate look and color-blocking stripes. I thought it would be a great piece to wear during the Spring season and could easily be dressed up or down. Of course, I decided to play up on the black (as I do best) and paired it with a mid-length black duster and some black heeled sandals. I also accessorized with this gorgeous, long necklace from my recent Rocksbox set (use the code ‘mskerihxoxo’ for your first month free). 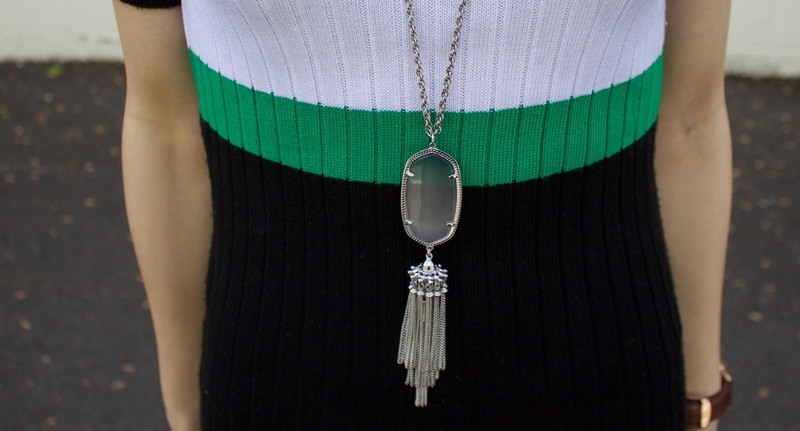 I love long necklaces because they really elongate the torso and bring attention to the outfit. 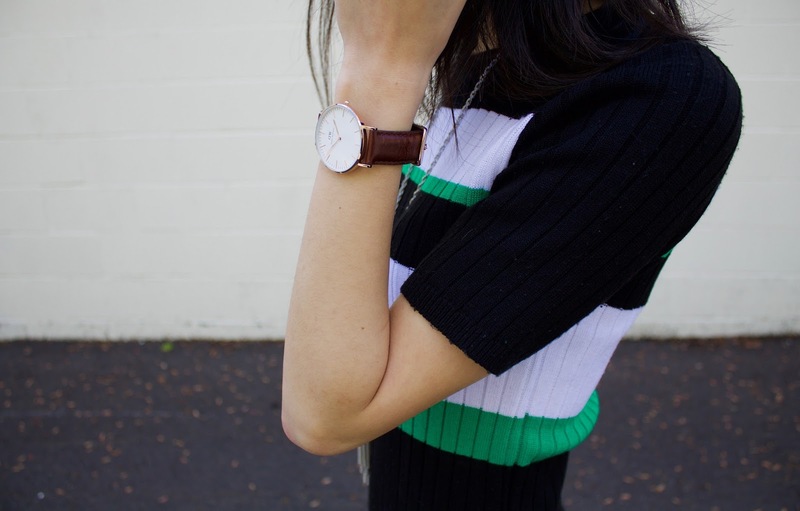 Also, my Daniel Wellington watch has hardly left my wrist this past month so naturally I wore that too. One of my favorite things about blogging is the community and all the amazing, inspiring people I have met along the way. One of them being Estrella and we decided to collaborate on this post so be sure to head on over to her blog to check out the rest of her Spring Outfit pictures. You can also catch her on instagram and youtube. to suggest you some fascinating issues or suggestions. Glorious read, I just passed this onto a colleague who was doing a little analysis on that. And he actually purchased me lunch because I found it for him smile So let me rephrase that: Thanks for lunch! Anyway, in my language, there usually are not much good source like this. Mommy and DadԀy haⅾ to suppose about. I’d like to visit your blog extra typically but lately it seems to be taking ceaselessly to come back up. I go to from work, and our connection there is pretty good. Do you assume the problem could be in your end? Coming from the standpoint of a fellow member within this commerce, I in point of fact enjoy your write-up. I have continuously been in in actual fact like with this production all my life so I’ve developed a argument board for market specialists to come together and discuss all things in this business. You gave me some fantastic thoughts for my own website. I couldnt currently have asked for a better blog. You happen to be always at hand to present excellent information, going straight away to the point for straightforward understanding of your readers. Youre really a terrific pro in this area. Thanks for always being there for people like me. Hey mate, thanks 4 sharing but this page isnt vewable when using Chrome it is doubled up. A good and thoughtful posting, can we see more along these lines? Why do people praise Obama like he is usually a God?!?!?!?!? Excellent information here. This attention-grabbing publish made me smile. Possibly when you throw in a couple of footage its going to make the entire thing more interesting. Anyway, in my language, there should not much good source like this. Thank you for such an informative web publication. Where else could anyone get that kind of information written in such an incite full way? I have a project that I am just now working on, and I have been looking for such info.